It can be difficult to get the best out of the smaller rooms in our homes, but this post aims to help you do just that with these expert space-saving ideas. Having decked out the smaller areas of our homes with mirrors and white walls in the hope they appear bigger, what else is there that can save space? 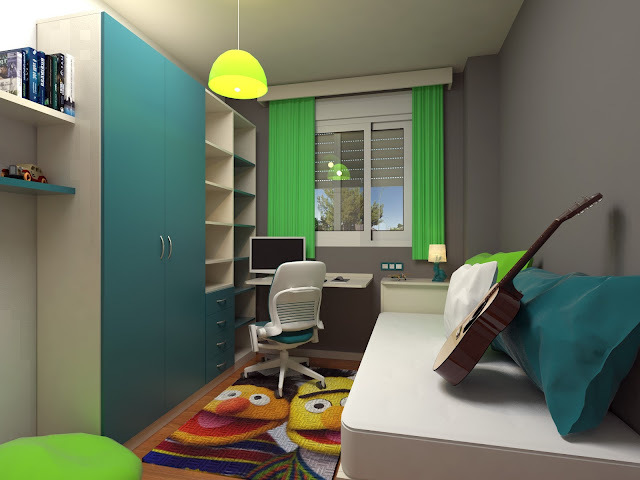 The majority of spare rooms will be used as guest bedrooms, playrooms, nurseries or studies, so they have a lot of potential. Dispense with divan beds and those with no under-bed storage - they take up dead space that can be great for storage. Instead get yourself a bed with storage compartments built-in, or with space for storage bags or boxes underneath. If you’re got kids of the right age, a bunk bed will be both exciting for them and give them a little extra area underneath. Getting a fold up or futon bed is a great alternative to a bulky permanent bed frame and is great for guests. Some rooms are prevented from reaching their potential simply because of awkward doors or windows requiring opening space. You might be stuck with a single bed in your spare room because of an inconvenient door opening. If you want to reduce the space taken up by internal doors, updating the style of doors or windows to those with less of an opening arc could mean you maximise your space; try bi-folding or sliding doors. Use your vertical space; we’re tempted to use floor-based storage as it’s very convenient, yet it takes up valuable room on the ground. Make the most of your wall space by utilising the top section of your walls; put in shelving above head height, instead of floor storage cabinets to give you more floor space. Our ceiling and corner spaces are rarely well utilised in most homes, but there is a lot of potential there for storage. Make use of hooks and wall-mounted storage units to get any items or clutter out of the way. Corner cupboards and units sit well in awkward places, so can be a great solution for an irregular room. With these simple tips, you’ll be on the way to getting the tiniest room in your house be a more usable space for whatever you’d rather use the room for, whether it’s a home gym, an office, a playroom, or a guest bedroom.